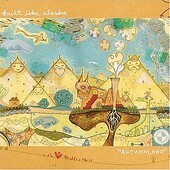 Pretty, sparkling indie-rock with a strong sense (and love) of pop, Built Like Alaska's Autumnland is rightfully titled. Like a good autumn, Built Like Alaska brings to mind those cold, windy mornings, while the sun is still shining, trees turning brown, leaves all over the place, and life just that much more beautiful. Songs like "Wet Hay In A Barn" deliver light, toe-tapping rhythms alongside a stark piano and somber vocals, while the stark beauty of "Controlled Climate", with its piano and vocals focus, showcases the delicacy of this band. Meanwhile, "Ran Into A Coroner" showcases the band's ability to create fuzz-pop, and "Does Your Mother Feel Sick" is all late-night, sleepy-eyed indie-rock with plenty of feedback to feed off of. Built Like Alaska may just be that! Cold and big, while keeping things simplistic and easy-going, the band creates a sound that fans of Grandaddy will instantly latch on to, one that isn't layered and dense, but still includes plenty of instrumentation and noise to fuel the otherwise stripped down, straight-ahead approach that the band structures their songs around. I'll give it a B+.